Stuarts Holdings now has the first Extensia™ concrete floor to incorporate underfloor heating. The installation uses a pigmented concrete with a polished finish. Extensia™ is characterised by its low shrinkage properties and reduction of steel, both of which are demonstrated in the industrial unit in Tamworth. Underfloor heating reduces the overall heating costs of the unit. By installing it within an Extensia™ slab, notable for its reduced depth, the thermal performance of the flooring system is enhanced. 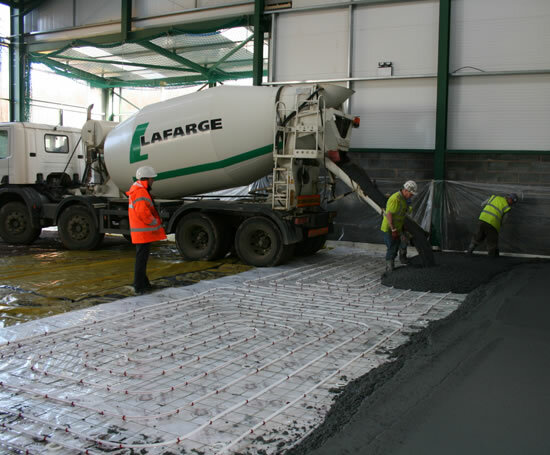 The integral colour pigment in the concrete offers better performance than dry-shake alternatives, which are prone to delamination, wear and colour variation. Pigmented Extensia™ concrete provides better distribution of colour, prolonging the long-term colour of the floor and removing the need for subsequent floor coverings. The aggregates matrix in Extensia™ allows the product to be polished to a very high standard.